Benson faced two challenges gardening on his land: lack of sunlight and lack of rich topsoil. Bensons land was classified as Clarksville soil. Clarksville consists mostly of chert (also called flint), clay, and carbonate rocks (limestone and dolomite). Along the high ridges the ground was dry with little or no topsoil. The deeper you traveled down into the hollows the topsoil became darker and richer. The ground was more shaded in the hollows and the shade helped retain moisture throughout all the seasons. The high moisture content helped decompose the leaves lying on the forest floor. Benson raked the leaves and rich, moist humus into large piles on rainy days and added cottonseed meal into the mix to help breakdown the leaves more quickly. 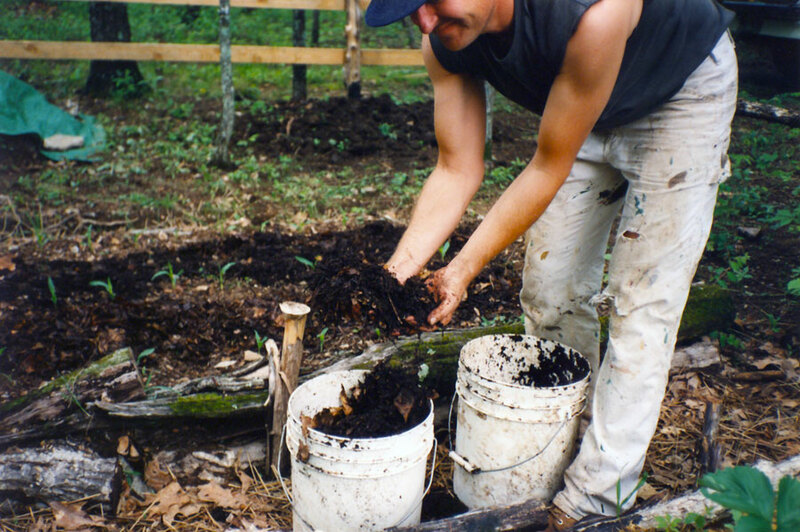 The compost in this photograph is one year old and was the only source of nutrients for the raised beds. 1991, scanned color print, 3 x 5 in. (7.62 x 12.7 cm). Ozark Series. © 2008 by Allen C. Benson.